When you are in this Oceanside city bordered by lovely Pacific Palisades and West Los Angeles, you’ll take comfort in knowing that a city emergency dentist is no more than a quick phone call away. You can conveniently call our 24 hour, 7 day a week hotline to find the most accessible walk in emergency dentist when urgent dental issues interrupt your visit to Santa Monica. No one wants to be walking on the beautiful pier here just to realize they need an emergency extraction! We’ve used our array of nationwide resources to compile a list of professionals that will accommodate you even for weekend dental care. 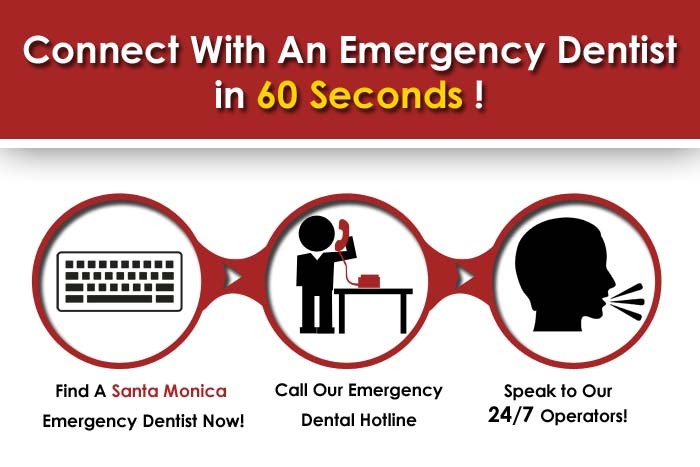 If for any reason you cannot get in touch with of any of these dentists in the event of an emergency in Santa Monica, we can also give you access to a hotline that acts as a service to refer you to Los Angeles walk in dentist offices that handle emergencies in the area. This lovely town full of surfers and students is not where you want to spend your Saturday or Sunday with intense pain from a toothache; you’ll find from us instant relief for these issues! This gorgeous beachfront city is literally named after a saint, and has arguably one of the most liveable climates you could ask for. Home to many film personalities and many great boutiques to shop at, the Santa Monica dentists we will link you to are vetted by the Emergency Dentists USA, and will be there for you in your time of pain and urgent need. When you are at your peak of discomfort from whats ailing you, you must not hesitate to call our weekend dental emergency hotline! Description: Connected to many weekend dentist services in Santa Monica, our referral service can get you quickly into the office of a caring practice for a weekend dental emergency that may arise and threaten to ruin your trip. Especially when young children fall prey to problems in the dental realm, beach vacations and the like can get very cumbersome. Our partners have great relationships with dental entities nationwide. Description:A Santa Monica dental office that truly makes satisfaction their number one priority, Steven Aaronson can schedule you morning, afternoon, or evening for anything that may ail you. He has been practicing in the area for over 25 years, and has a doctorate in dental surgery from New York University’s College Of Dentistry. Bridges, veneers, and urgent root canals can all be performed here at the hands of caring professionals. Description:This board certified dentist comes highly recommended in Santa Monica, and his office is equipped with the best in x ray technology and dental chairs. Serving the city for the last decade, he just went through extensive remodeling three years ago, and boasts a very high tech environment that is nothing like the dentists of yesteryear’s confines. Carefully screening all of his employees to make sure they are the upper end of the talent pool, this is an excellent choice for a service provider. Description:Fixed bridges, crowns, and urgent treatment of Periodontal disease are some of the procedures that you can get with confidence within Ryan’s practice. Rated by testimonials as one of the most gentle and accommodating emergency dentists in Santa Monica, most gave him 4-5 stars. Having received many honors such as the Joseph B. Barron Award for prosthodontics, he is a professional that truly gives you many reasons to show your smile. This beautiful city by the sea is where you can find attractions like the California Heritage Museum and the glitzy annual Santa Monica Film Festival, and you can get a glimpse by foot at the legendary Palisades Park. Fitness fanatics love landmarks like the Santa Monica Stairs, that lead you majestically into the Santa Monica Canyon. 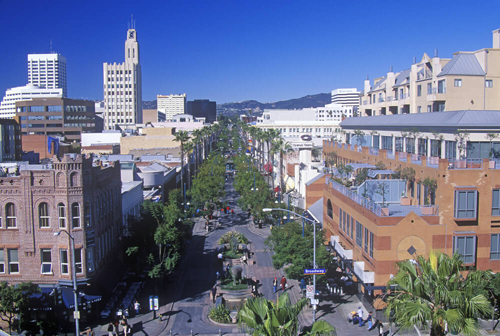 With so much to see and do here, it could be a big surprise to realize that you immediately need a 24 hour dentist Santa Monica, CA. Don’t hesitate to call Emergency Dentists USA if your stay by the sea becomes interrupted with severe pain or other dental issues! Visit the santa monica ca chamber of commerce. Find emergency dentists in Pasadena, CA here.